Our dentist, Dr. Le, is pleased to be able to offer one of the newest and most innovative solutions for receding gums, Chao Pinhole® Surgery. There can be several reasons why you are suffering from receding gums. The most common is that you are suffering from gum disease. Smoking is also considered to put patients at a much higher risk of gum recession. The most obvious symptom of gum recession is the visual one. When a patient with receding gums smiles, their teeth will appear much longer than usual, and in some severe cases, the root of the tooth may be exposed. The Chao Pinhole® Surgical technique is a minimally invasive treatment for gum recession created and patented by John Chao D.D.S. While conventional gum recession treatments involved grafting, Chao Pinhole® surgery is scalpel and suture free, meaning that patients can enjoy fewer complications and a faster recovery time. 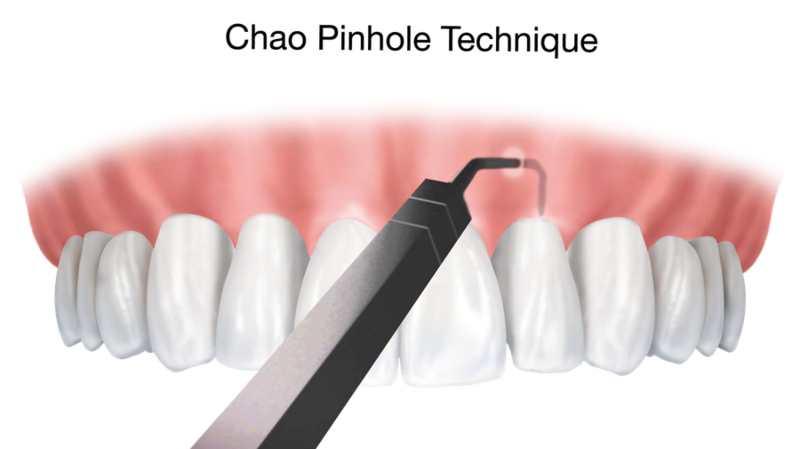 The procedure is carried out through a small hole into the gum, which is made by a needle. Once the entry point has been made, special tools can then be used to loosen and manipulate the gum tissue, so that it covers the area which was previously receded. The cosmetic benefit of this surgery is instant, as the gum line is immediately restored, and the patient will have a smile that is even and beautiful once more. No scalpel means that no sutures will be required to be put in place or removed. Several areas of the gum can be treated in one session. Your smile is improved in just one day. Minimized risk of complications such as post-operative bleeding. If you have receding gums and would like to explore the possibility of Chao Pinhole® surgery, our team would be delighted to schedule you a consultation with Dr. Le. Combining this innovative technique with our exemplary patient care, we can restore your teeth and help you achieve a beautiful and youthful smile once more. Please make an appointment by contacting our Vienna, VA office today.